Prized for elegance and warmth, hardwood floors add beauty and value to your home or business. Hardwood flooring is a timeless option that complements any décor. For expert assistance in choosing hardwood, turn to the professionals at our family-owned-and-operated flooring store. Let us help you decide between engineered hardwood flooring and solid hardwood flooring. Count on us to select your hardwood floors from our stunning collections. Our store is part of a buying bloc that includes more than 500 other franchises. This empowers us to select the best of the brand-name flooring in a wonderful array of wood species, finishes, glosses, and grains. Our customers benefit from the extensive selection and quality products. Bring nature inside with the splendor of hardwood flooring installation. The grain and luster of real wood is unsurpassed in visual appeal. Did you know that wood is an environmentally friendly flooring option? Yes, it is a sustainable natural resource. In fact, wood floors take many of their best qualities from the forest. Hardwood floors are long-lasting and easy to clean and maintain. Regular dry mopping keeps them handsome and occasional damp mopping with a wood cleaner ensures a glossy shine. Hardwood flooring makes breathing easy for people with asthma and allergies. This flooring is hypoallergenic and allows no place for dust mites to hide or mold to grow. We offer our customers two types of hardwood flooring – engineered or solid wood. Lifestyle plays a big role in determining which is right for your home or business. Engineered wood consists of a layer of the hardwood species of your choice on the top. Underneath are multiple layers of plywood or fiberboard that are bonded together for strength. The manufacturing process results in wood that is durable and resistant to moisture. Engineered wood does not expand or contract according to the level of humidity in a room. This makes it ideal for spaces with heavy moisture content, such as kitchens or basements. The other option for hardwood flooring is solid wood, made from a single plank of milled hardwood. Solid wood costs a little more than engineered wood, but these dense, thick planks are well worth the price. This type of flooring can last as long as 100 years. After many years of wear, homeowners have their floors sanded and refinished, which restores the beauty of hardwood for generations to come. Protect the investment in your stunning hardwood flooring with professional installation. Let us provide you with installers who use their skill and experience to ensure the enduring beauty of your hardwood floors. A couple of days before the actual installation, we deliver the wood to your house so it has a chance to adjust to the humidity of your house. On installation day, our professionals remove the old flooring and make sure the subfloor is clean, dry, and level. We lay the planks carefully with an eye to visual appeal and proper fit, making sure that the wood lays flat and even. As professionals, we know that proper hardwood flooring installation safeguards the wood from damage and extends its lifespan. 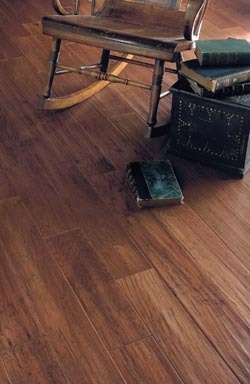 Ask us for specifics about the different types of hardwood flooring or the installation process. To find out more, simply call <PHONE>, or use the form to the right to reach us anytime you want!